The Hario Buono Electric Power Kettle is a straightforward and stylish kettle. The gooseneck spout allows you to pour with ease and control. The plastic knob and handle make pouring safe and comfortable. In one flip of a switch you can boil water and the kettle will automatically shut off once the water is boiled. It also features a cautionary "Boil-dry Protection" which will cut off power in the event that the kettle is turned on accidentally without water inside. This cordless kettle can be detached from any angle of the base and the cord can be stealthy coiled under the bottom of the base. 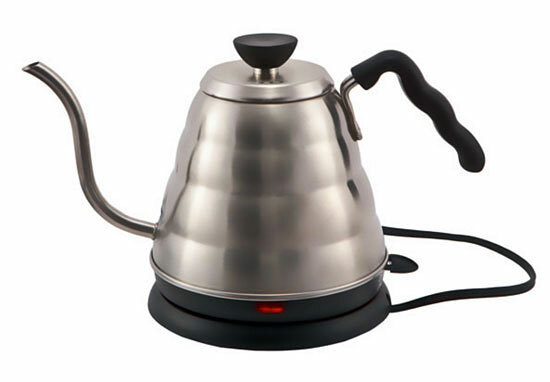 The kettle offers simple operation and styling consistent with the Hario V60 line of products. Like the Buono stovetop model, the gooseneck spout allows you a lot of pouring control, essential for pourover brewing.